It would come as a surprise to many that there are hardly any teaching courses in Iqbal Studies as such. Despite the fact that Iqbal Studies has been an acknowledged subject in universities, especially in Pakistan! 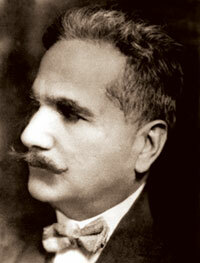 Therefore, the online course Introduction to Iqbal Studies is a pioneer in two regards. It’s for the first time that a proper course has been developed to introduce an average learner to the relevance of Iqbal’s message to the world today. Secondly, it’s the first time that such activity is being offered online. The fee has been kept low to encourage wider participation: PKR1000 (one thousand rupees) for Pakistani students and US$24 (twenty-four US dollars) for overseas. The course has been designed by Khurram Ali Shafique (whose biography of Iqbal was nominated for the Presidential Iqbal Award recently). It is being offered under the auspices of Educational Resource Development Centre (ERDC) in coordination with Dr. Iqbal Society of North America (DISNA). Academic support has been provided graciously by Iqbal Academy Pakistan. Induction: abridged translation of an excerpt from Javid Nama, describing the ultimate ideal that Iqbal desires and foresees for humanity. It is a world where people live inside-out, bodies have become contained in souls rather than the other way round, there is no crime and everybody lives in material and spiritual bliss. Is this world possible? That is the question which is central to any genuine learning in Iqbal Studies, and learners will be encouraged to arrive at their own answers. The Conquest of Nature: This is a poem in five segments describing, respectively (a) the birth of Adam; (b) the Devil’s animosity; (c) the Temptation; (b) the sweet challenge of the worldly life; and (e) Adam’s explanation to the Almighty on the Day of Judgment. In five short scenes, the poem gives us a complete overview of the past, present and the future of humanity as Iqbal perceives it. This is the broad outlines in which learners can fill in details as they move along in life and studies, even beyond and after the completion of this course. The New Garden of Mystery: Iqbal summarized his philosophy in the form of nine questions that are cross-cutting across all fields of human knowledge – i.e., each of these questions can be answered through any discipline according to the scope of that discipline. Here, the learners will be encouraged to find answers from brief synopses of Iqbal’s works. The aim of this component is to give the learners a handy introduction to all the poetic works of Iqbal and also to show them the nine basic issues that can be used for summing up the entire philosophy of Iqbal – and possibly also the entire range of human knowledge in the present age. The Sphere of Moon: This chapter describes the beginning of Iqbal’s spiritual journey in search of immortality under the guidance of the spirit of his mentor, Maulana Rumi, in Javid Nama. On Moon, which is the first stage of the journey, they come across seven visions: (a) the Hindu sage Vishvamitra; (b) the music of Sarosh, the angel who inspires poetic visions; (c) the poetry of Sarosh; (c) the Tablet of Buddha; (d) the Tablet of Zoroaster; (e) the Tablet of Jesus; and (f) the Tablet of Prophet Muhammad (peace be upon him). These visions are brief and engaging introductions to seven cultural forces shaping the human civilization even today. Learners will be encouraged to explore the relevance of these cultural forces, and to develop personal insights about them. Application: These concluding lessons facilitate the learners to make some personal action plans in the light of Iqbal’s thought. The course material comprises mainly of three components: (a) the course manual; (b) videos; and (c) the blog. Course Manual will consist of approximately 25 lessons (see “Course Outline” above to get an idea about the contents of these lessons). It will be provided to participants in PDF and MSWord formats. They can take printout and do the activities. Videos. There will be a brief video to accompany each lesson. These videos will contain a mini-lecture to go with the lessons given in the manual. They will be uploaded on YouTube for participants to view, and links will be provided (Pakistani students will be provided the course manual as well as videos on a CD). Blog/Discussion Group. Each lesson in the manual will lead to an open-ended question involving reflection and thinking from the participants. They will be required to post their answers as "comments" on the official blog of the course, or as posts on their own blogs if they have any. They will be able to choose whether they wish to do it on a daily basis or only once or twice a week. (In case the blog doesn't suite you, you can join an email discussion group). Q. Would the material be posted at home? A. You can receive all the course material through the Internet. It will be emailed to you. Q. If it's online, then why the specific dates? to assign a date when the professional obligation of ERDC and myself comes to an end: if there is no end-date, then we would be obliged to remain engaged for an unlimited time, which might not be feasible. Q. How will you teach this course? Via some software? What would be the timing (and days in the week) and how many classes? Participants will be given a course manual consisting of approximately 25 lessons. They can take printouts of activities and do them on paper. These are comprehension activities. The outcome of each lesson will be a reflection, which the participants should post as comments on the official blog of the course (soon to be announced), or as posts on their own blogs, if they have any. Many lessons will be accompanied with short videos that will be uploaded on YouTube and can be watched or downloaded by participants. Pakistani participants may also be given these videos on a complimentary VCD. The lessons are scheduled in such a manner that the participants can either work daily (for an hour or so), or at their own pace as long as they spend 5 to 7 hours a week on the activities and postings - some participants might be spending time on the course only on weekends, and catching up in that manner. Minimum age limit is 13+ (minors may be asked to take permission from their guardians). Minimum qualification is lower secondary (Grade 8). Presently the course is being offered in English only. However, it is designed with special consideration for the difficulties faced by many non-native speakers – we do not want language to become a handicap. It is a 10-week course offered four times a year. The next session starts on September 5, 2011. Registration close on August 14. I'm glad to see such a nice website regarding a great personality of his age, who is still inspiring and influencing the people even today. He along with his philosophy is still living in our hearts. Dr.Allama Mohammad Iqbal has died but his thoughts are alive even day, and will be forever, inshallah. Can you please add link of Official blog of the course? Sir, its a great initiative! The course outline you mentioned, in my opinion, is very appropriate. This introductory course will give participants a comprehensive overview of Iqbal works. It is a great effort which must be appreciated. The management of ERDC has done a real step in nation building. I have read books on Iqbal for my graduate course from Open university but could not complete if u can register me I will complete this online course I would love to study Iqbal. I would send you prescriber fee of one thousand. pl respond me asap. It is a great step towards knowing Dr. IQBAL using the technology and making it possible for every one in the world to explore a different horizon for oneself. JAZAK ALLAH KHAIR ---- ERDC. salam.HM2LILLAH....I WAS EAGER for this type of course online cz i m livin out f PAKISTAN.i luv PAKISTAN...n i luv IQBAAL rahmatullah alaih. I WILL DEFINATELY START THIS COURSE. its a gr8 achievment that still we hav the luvers of ALLAMA IQBAL and it would be a gr8 expereince if any one do that kind of course.i would like to congragulate MR.KHURRAM ALI SHAFIQUE that he is doing such a wonderful job.may Allah gives u more success in ur noble aim. I am very happy to see this remarkable achievement. Assalamo Alaykum, I congratulate Mr. Khurram Ali Shafique to take such a reverend step to introduce Iqbal Studies course using modern tools i. internet and this course is definitely likely and beneficial for everyone who live in the country or out of the country. I am professional Turkish Language Translator/Interpreter and also I am an Esperantist (an auxiliary langauge speaker). I would love to study Iqbal deeply and have een interest to translate Iqbal works in Esperanto langauge. May Allah give me wisdom with passion and May Allah bless you all who thinks our about us, about our thought provokers. It is Really a work of great people that they dont forger their Pioneer.Being a human it is our moral duty to remember the Prominient work of our Great Allama Iqbal (R.A).Through this channel of Iqbal we can get awarness with Real Iqbal and his Vision . May Almighty Rest the Soul of Iqbal in The Highest Place of the Paridise Ameen. happy to know that the course is kind of a back to back thing...repeats..
there is so much to learn and know in Iqbals poetry and prose, no on has seriously worked for it, or no one that i know...I know little. medicine doesnt seem to give me a break...at the brink of postgraduation...FCPS. most of the ppl here are God fearing pious people...please pray for my success in this gigantic exam...May Allah give u the reward .. I am very delighted over the initiative taken by you and your team regarding the certification in Iqbal studies and continue spreading his highly respected ideology which very few are able to understand and implement to the society. I want to be part of the certification and therefore it would be highly appreciable if you could send details regarding the next session or the current ongoing session if i can get enrolled anyway. thank you. i would also like to enrol in this course. when does its next session start.please reply asap as i am very eager to join. when will be the next session starts ??? this is absolutely one of the good sight.as the age goes the old philosphers r obsoleting but i think this is even better effort to renovate ideas for the next generation thumbs up! I would like to enroll for the course,I am not sure how much time I will have to spend each day.In this course are we going to be given grades? I am nervous about it.I am in the habit of procrastinating.I do not want to give a bad impression.Given the fact I have not studied for sometime. not done any of it and I have missed the deadline.I will be thankful if I am given the next session date.Shukria. @Anonymous: next session starts in March, and information will be displayed on the other blog mentioned above, or the course page here (not this page, but the link in the bar above). May I please get the book list address?I did see it online but neglected to write the name of the site.I think I am ready to order some of the books.Thank you very much. kindly tell the details of the next course.i really want to work on Iqbal's life n need ur guidance.my email tayba78@gmail.com. Today suddenly I become to know through the website on Allama IQBAL about the online course in Iqbal Study. I was surprised and very very happy to see that still there are people who not only love IQBAL but also struggling to spread the teaching of IQBAL. Well done sir. Today our nation is vastly unaware about the precious philosophy and teaching of IQBAL which is purely based on ideology of Islam. Where ever we go, what ever course we adopt, we can not unite and we can not forward and over come our issue till we follow IQBAL. I will further study about this online course and will soon join it in next session. Inshallah, Soon I will register myself with this LOVELY course offered by you. Congrataultions for such a great effort. are you planning to lanuch this course in other languages like in Urdu & Persion? We would love to read and understand Iqbal's thoughts in his own langauge of expression. @Anonymous: if your concern is to read and understand Iqbal's thought in his own language of expression, then you should ask the courses to be offered only in English, since Iqbal expressed his most important ideas only in that language. He himself said that much. The ideas expressed in his Urdu and Persian works also evade us unless we first read his English prose :-). For a lost person like me it is possibly a chance to get out of confusions well......desperate to join this course.....what are the new dates from now? For a lost person like me it is possibly a time to unlock my confusions....desperate to join the course ....what is the new date from now? When is the upcoming starting from? This is amazing. Government should make it compulsory for all Pakistanis or at least these dumb headed politicians. "Pakistan: the Next 20 Years"